I discovered Laini Taylor’s writing in 2009 when I was contacted about reviewing her Dreamdark books by the publisher. They’re middle grade, which I didn’t realize at the time – and I’m glad I didn’t since I quite possibly would have thought they were too young for me to enjoy and passed up the opportunity to read a couple of wonderful books. Blackbringer, the first of these, was quite good, but it was the second book, Silksinger, that convinced me I must read anything I could get a hold of written by Laini Taylor. Later that year, Lips Touch: Three Times was released, and I purchased a copy soon after it was available even though it was a collection of 3 stories and I don’t tend to have great luck with shorter fiction. I loved it, especially the dark story “Hatchling” (which remains my favorite of her stories, including her novel length stories). Naturally, I was thrilled when Daughter of Smoke & Bone was one of the ARCs available at last year’s BEA and was second in line for the author signing. I started reading it on the long bus ride home even though it was the end of May and the book wasn’t out until the fall (I don’t usually read my early copies that early and try to wait until closer to release date). Once again, I found a book I loved for the gorgeous writing, the dialogue, the characters, and the mythology. But what continues to stand out to me the most about Laini Taylor’s books is the writing – no one writes quite like she does. Her writing isn’t dense, but she has such a way with words and can do everything from write a beautiful passage to humorous dialogue to a description of emotion that cuts right to the heart of how it feels. When Laini Taylor posted a picture of her author copy on her blog the other day, it reminded me that the wait is almost over! 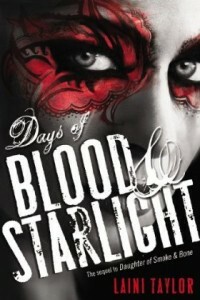 On November 6, Days of Blood & Starlight will be released in hardcover, ebook, and audiobook. The aforementioned blog post mentions it’s Laini Taylor’s longest book yet and is 100 pages longer than the first book in the trilogy. It also has a link to read the first seven chapters of the book. If you haven’t read the first book, don’t read that one since there will be major spoilers! You can read this excerpt from Daughter of Smoke & Bone instead. I haven’t read the excerpt from Days of Blood & Starlight since I prefer just to read the whole book at once, but from the sounds of the comments it does end on a huge cliffhanger – so if that’s going to bother you, beware! Also, there are spoilers for book 1 in the description of book 2 below. 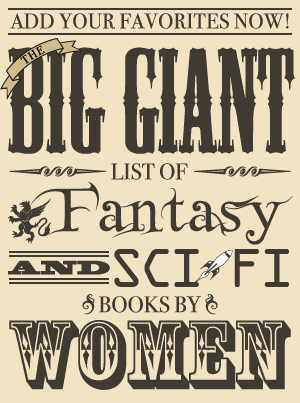 I’m not quite sure just how spoilery they’d be to someone reading it who knew nothing about the first book, but those who haven’t read the first book may want to skip it just in case. Ar student and monster’s apprentice Karou finally has the answers she has always sought. She knows who she is–and what she is. But with this knowledge comes another truth she would give anything to undo: She loved the enemy and he betrayed her, and a world suffered for it.